ESPN has been a staple in sports media coverage since 1979, covering American traditions like football, basketball, and baseball on collegiate, semipro, and professional levels. 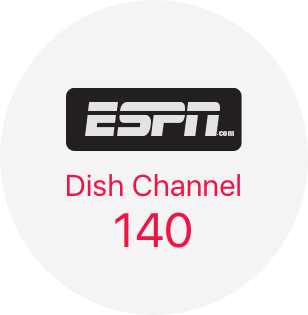 Get DISH America’s Top 120 or higher to enjoy the following ESPN networks included in your channel lineup—with ESPN available in nearly 95 million American homes every year,2 you’ll be in good company. 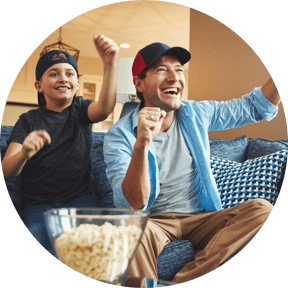 For game days when you don’t want to miss a moment, use MultiView mode on your Hopper® 3 to turn your living room into a sports bar. 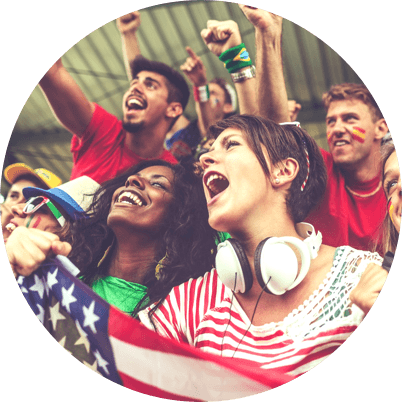 MultiView lets you display up to four channels at once so you can keep tabs on multiple games without flipping channels or constantly checking scores on your phone—plus, it can help you attract more friends for the party. Parties not your thing? Record up to 16 channels at once and catch up on the games later. The bread and butter of ESPN, this fast-moving daily show highlights scores of recent games and airs feature-length stories on hot topics. This weekly broadcast—one of the highest-rated, longest-running programs on primetime TV—airs NFL games you don’t want to miss. This documentary series gives you the scoop on some of the sports world’s most intriguing people and events from history. Sports TV personalities Tom Kornheiser and Michael Wilbon debate on major sports stories of the week in this fun, irreverent show. On Saturdays during football and basketball seasons, reporters predict the day’s outcomes from the campus of a featured home team. ESPN is available in every DISH America’s Top package starting at America’s Top 120, but you don’t have to stop there. When you get America’s Top 120+, 200, or 250, you can enjoy even more networks covering college, regional, and pro sports. Also, no matter what package you choose, you can add entire packs of premium sports channels for even more coverage on the games, teams, and sports you love best. 1 Deadline, "Cable TV Rankings 2016"
2 TV by the Numbers, "List of How Many Homes Each Cable Network Is in as of February 2015"